Agatha Christie: Murder on the Orient Express is a 2006 point-and-click adventure game developed by AWE Productions and published by The Adventure Company for Windows. The game is the second installment in The Adventure Company's Agatha Christie series. The setting is five years before the events in Agatha Christie: And Then There Were None, with a largely unrelated storyline. The plot follows an amateur sleuth, Antoinette Marceau, and her investigation of a murder with twelve possible suspects aboard the Orient Express, a train that has been blocked by an avalanche in the Kingdom of Yugoslavia during 1934. She is aided by famous detective Hercule Poirot. Murder on the Orient Express retains the main plot elements of Agatha Christie's novel of the same name. An additional ending is presented in the game which differs from the conclusion of Christie's novel. As with And Then There Were None, Christie's novel has been bundled with the game. Some reviewers of Murder on the Orient Express criticized the game because of the repetitive nature of tasks the player must complete, and also complained about the inefficient and cumbersome inventory system. Others have praised it for improved graphics compared to And Then There Were None, as well as convincing voice acting and audio effects. Murder on the Orient Express is followed by Agatha Christie: Evil Under the Sun, the third installment in the Agatha Christie series. 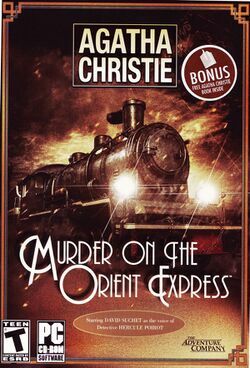 Murder on the Orient Express is the first game in the Agatha Christie series to feature Hercule Poirot, Christie's most popular and famous detective. David Suchet, a well-respected portrayer of Poirot who achieved fame through the popular television series Agatha Christie's Poirot, was hired to provide Poirot's voice. His performance was generally met with praise. Some have criticized the game for not allowing the player to actually control Poirot; the developers explained this choice by saying that adventure gamers who make mistakes throughout the game do not reflect the genius of Poirot, but are better represented by amateur sleuth Antoinette Marceau. This page was last edited on 3 July 2012, at 15:24.